So I was wondering why the zucchini plants growing in one bed were half the size of the ones growing in another. The answer became apparent as the zucchs set. The soil in one bed is lacking in calcium. The signs being a nasty little problem called Blossom End Rot. I’m ok with it as I’m drowning in zucchini at the moment and I’m choosing to see this as a valuable garden lesson. Still, I don’t like to see unhappy plants. I’ll be laying them to rest in the compost and adding lime and crushed egg shells to the soil, reapplying mulch and hoping for better healthier plants next time around. I’ll do a soil test in the future to see if I got it right. Zucchini Blossom End Rot is not your friend! Make sure you look after your soil and avoid these problems! So I’ve been getting all angsty about my Brussels sprouts Brassica oleracea var. gemmifera. It turns out I planted them at the wrong time – curse you garden stores with attractive looking punnets. Apparently, I should be planting them now instead of 3 months ago. Second thing I got wrong – they require a much firmer soil then the bed they are in right now. Well-limed, well-drained, well-firmed is the advice I’ve just received on the topic. Apparently, they’re a bit fussy. But I reckon these babies are going to be sooo worth it. I realise this can be a very contentious issue. They are one of the least liked vegetables. 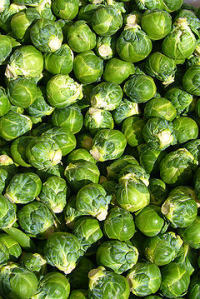 But I think Brussels sprouts have just had really bad press. They’re delicious when grown well and cooked properly, with a really nice nutty flavour.